Members of the men's and women's swimming and diving squads and the men's and women's water polo teams participated in a fundraiser for the organization Swim With Mike to support physically challenged athletes. 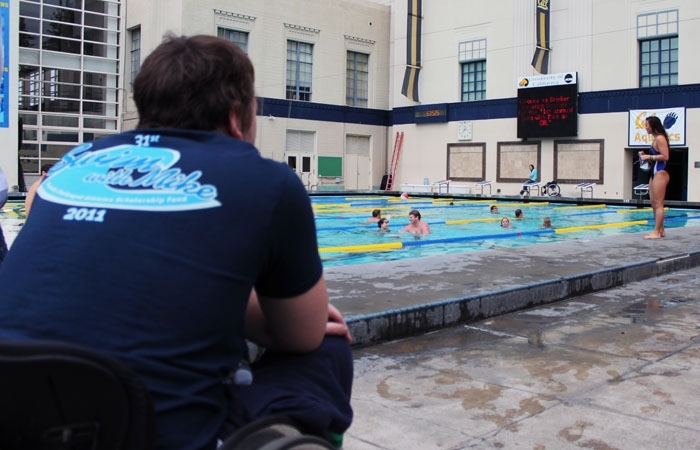 Swimming relays and belly flopping into the pool, members of UC Berkeley's four aquatics teams met Saturday to raise thousands of dollars for the organization Swim With Mike, a fund to support physically challenged athletes. At the event, held at the Spieker Aquatics Complex, members of the men's and women's swimming and diving squads and the men's and women's water polo teams participated in several competitions, including a backwards relay and a surfboard relay. The event was organized by UC Berkeley senior Austin Whitney, a Swim With Mike scholarship recipient, and recent UC Berkeley graduate Mike Sample, former co-captain and member of Cal men's water polo team. They raised about $12,000 total after Tod Spieker - whose brother, Edward Spieker, the pool is named after - matched the money raised at the event, exceeding Whitney's goal of $10,000. "I've had this event in my mind as a little dream for about a year now," Whitney said. "It's really great to realize a dream." The organization began in 1981 at the University of Southern California after a swimmer was injured in a motorcycle accident. It expanded nationally in 1999 and, over the past 30 years, it has given over 100 scholarships to disabled athletes across the country. When Whitney was severely injured in a car accident nearly four years ago, his college plan to attend the University of Michigan crumbled as his college fund diminished to pay for medical bills. However, thanks to Swim With Mike, Whitney received support, came to UC Berkeley and is ready to graduate in May. "It's the insurance policy that I never knew I had, never had to pay a dollar for, and was there for me and all my teammates from the minute we started playing sports all the way until the moment of our injuries," Whitney said. "They've been like a family to me." This was the first year of the event at UC Berkeley, although several other annual Swim With Mike fundraisers have been at other universities. "Stanford had an event the last three years," Whitney said. "I love, love, love Berkeley. I thought we could totally do this, and we could totally do better." Cal swimming and diving coach Teri McKeever said she was glad the event was held at UC Berkeley, after graduating from USC herself and knowing the organization's founders. "It's an opportunity to do something good and support a good event, and all the aquatic coaches felt the same," McKeever said. "I told the girls (on the swimming and diving squad) it's the only thing I give money for at USC." McKeever said she took time in the months leading up to the event to raise team members' awareness of disabilities by having Whitney talk to the squad about his own experience, adding that it is easy for students to get caught up in their own lives. "I've tried in the last few months just to educate them," she said. "Being a responsible citizen of the world is to become more aware of how you can help and be more aware." Senior Amanda Sims said she was inspired by Whitney after he talked to Cal's swimming and diving team. "We talked to Austin, and he's really passionate," Sims said. "It makes us realize our ability, and it makes us feel grateful for our education and Cal athletics at the same time." Whitney said the entire Department of Intercollegiate Athletics was supportive of the fundraiser. "I think they can all relate," Whitney said. "They see me, and they think 'if I was injured this organization could help me.'" Athletes enjoyed the relays during the event, and the crowd cheered poolside during a backwards swim relay after the women's swimming and diving squad challenged the men's squad to the race. McKeever said after talking about holding an event at UC Berkeley for years, she hopes the event will continue as an annual fundraiser on campus. "It is really truly a unique scholarship. It helps hundreds of disabled athletes," Whitney said. "It was the greatest gift." Mary Susman covers Berkeley communities.